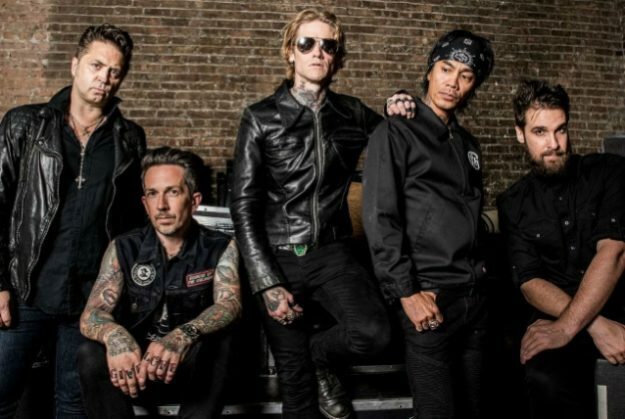 Buckcherry are back with their first music in over three years with the cover of the Nine Inch Nails classic Head Like A Hole. The cover song is taken from Buckcherry’s forthcoming seventh full-length album, Warpaint, which will be released in the spring via Century Media/RED Music. Helming the sessions is producer Mike Plotnikoff, who previously worked with the band on 2005’s platinum-certified 15 record. Buckchery’s new CD will mark the band’s first release since the departures of guitarist Keith Nelson and drummer Xavier Muriel and addition of Kevin Roentgen and Sean Winchester, respectively. The band will bring its live show to California for a handful of headline dates this January before heading overseas for their month-long February European tour. Expect a jam-packed year full of touring in support of their forthcoming album. Well…that’s a thing that happened. I like NIN…and they always put on a great show. What’s funny about this version of Head Like A Hole is that there is no drum machine like the original but, once again, Buckcherry finds a way to perform a song devoid of soul. The NIN version from 1989 may be programmed, but has a bite that is hateful and angry. I saw Buckcherry open for Scab Kiss at MSG in 2009, they eneded their set with, again, a sterile version of Highway Star. These guys were heralded as the next AC/DC, bringing hard rock back blah blah blah…I just don’t get it. They’re not that good, honestly. They can play instruments, yes. But they not only cannot write a song that gets stuck in your head, they can’t even put feeling into a song that had a drum machine. Does anyone out there know how to right great hooks anymore? I am sure you don’t like Airbourne either, because as far as I am concerned, they are far more likely to be AC/DC’s successors, than Buckcherry. I love this NIN song, but let’s be honest, other than the chorus where Reznor is screaming, the rest is quite electronica. At the time, I know this genre was considered Industrial, but it had major elements of new wave and electronica.